I’m writing from a farmhouse in the Loire Valley, just having completed a 10 week house sit in a beautiful self built eco Wooden House just 30mins from here. Our host and friend arrived yesterday for a handing over of the keys, welcome meal and an afternoon’s unpacking and rearranging before we headed on, van packed to the gills. At 10 weeks, this is the longest house sit yet, and although I’ve been calling it a “sit” that’s not truly accurate, because I don’t honestly think this friend needed their house occupied for that time period – it was more of a favour/exchange. It’s been the most ambitious house sit yet, being abroad in France where I don’t (yet) speak the language plausibly. It’s also my first try at being a true digital nomad, in that over 95% of my income for the period was from online work (Skype teaching). As you can see from the pictures, we have been exceptionally lucky with a gorgeous location and beautiful house, however I wanted to write mainly about the challenges presented by a longer house-sit abroad and what I learned from them. Van: I travelled without breakdown cover, because it would have cost £200 and I was advised that in France garages are plentiful. There were two problems in 10 weeks (that’s the type of van I own!). One non-starter – the local garage came to fix it, and one flat tire – I actually managed to drive to the tire-shop without creating further damage. Having no cover is quite high risk and I do still feel uncomfortable with it. Because I didn’t speak French, it took me two weeks to get the van fixed in the first instance, meanwhile cycling 14miles back and forth for food shopping. My bike was my “breakdown cover”. If you’re thinking of travelling without cover, it’s best with spare food, a bed and a bike in the van, not to mention never leaving the house without your phone and wallet. I learned that the hard way. My things. Music stuff on the left – recording studio, keyboard, guitar, flutes, live kit including amp. On the right, my personal possessions including cycling stuff (bike in van). May not seem like a lot but feels that way when you have to keep moving it. Sadly I’ve actually used all of it, so what can I discard? Being in a house for longer there’s also more chance that something might break. I’d never broken anything during a house sit, but this time there were two broken glasses, a joint snapped on a chair and the plumber needed calling out when the toilet leaked. This panicked me! I prefer to leave a house just as I found it if not better, often cleaning, clearing or sorting some corner as a thank you to my hosts. Although we did plenty of that, I was still terrified. In the end I just had to accept that these things will happen from time to time. France: The house sit was located in rural France, meaning that for the whole stay I really only spoke to 5 people besides shop staff. Although I wasn’t lonely, I felt very exposed, lacking the recourses of a more populated area. If I needed something, it wasn’t always possible to buy it. As a result, I joyfully found that the few neighbours were extremely collaborative. One picked me up from the rail station an hour away(! ), after my train was delayed and the busses had finished. Another neighbour I took to work when her car was totalled. A culture of lending and giving freely was engendered by this isolation, despite the language barrier. Amazing! Being a Digital Nomad: Focus focus focus! Many people must be imagining me leading the French lifestyle, a man of leisure, never having to go to the office. Whilst it is pretty idyllic, of course I go to the office, or rather the office comes to me. Right now, this is my view, sat in my van working. I’ve just had a Skype call with a colleague discussing a student’s essay draft, and look forward to writing up my lesson reports this afternoon, and preparing my tutorials for the evening. My schedule is different every week, but the most important thing is to be focused – both to be working when I am working and to play when I am playing. I’m still learning this and will write a post on it soon. Hope this post has been useful to anyone thinking of trying house sitting, digital nomading, or other alternative lifestyle ideas. Because the idea of running out of money held so much fear for me, I decided to deliberately let my bank account run to £0 and then work my way up from zero. It was almost as though I thought I would die if I ran out of money and had no work planned. At the very least, I imagined myself abandoning all else to stand in the street and sing for my supper, then going home to the van and hatching plans to tout myself around for as much work as possible. 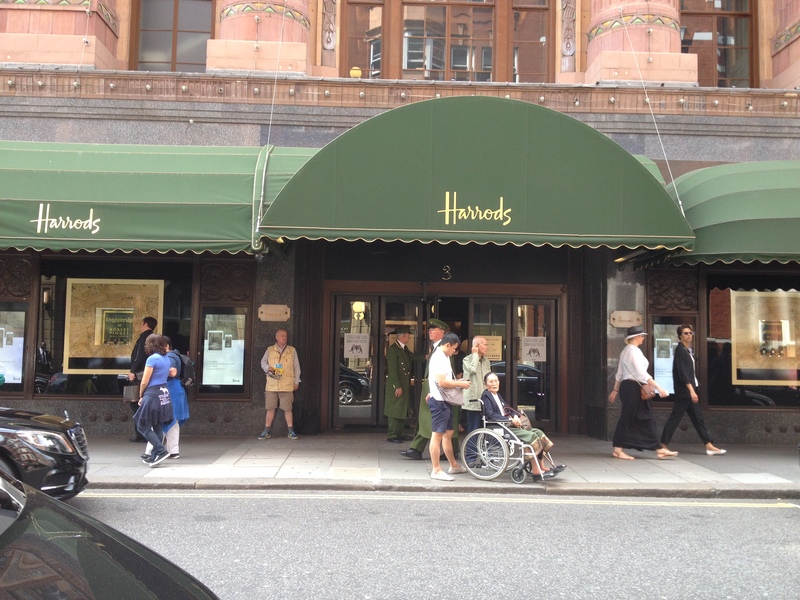 Would Harrods be a good place to busk? This Big Issue seller seems to think it’s a great spot. The reality was much less dramatic – almost disappointingly so. On June 18th I ran out of money, spending my final pennies at the sweet shop in order to get to exactly £0. I still had some groceries left and some fuel in the tank. Would more money come in before those supplies ran out? It was very easy. That same day, someone contacted me about doing enabling/care work for them so I booked couple of days at the end of the week. Rather bizarrely, later that day someone else contacted me about the same thing, so I booked a day with them for the following week. With a little busking to top it up, I realised that’s all I need for now. So there you have it… the anti-climax. Quite profound don’t you think? My attempts to put myself in a desperate situation have failed. It’s proved impossible for me to do so. I’ve learned that living abundantly is not about money but resources – it’s just that we’ve been conditioned to believe that money is the only resource. Since running out of money 2 weeks ago, I have been working my way up slowly, but funds are still low at best. A highlight of my week was singing in Chichester market square with a sign saying “Busking for tickets to the opera”. The experiment has changed me permanently in ways I could never have predicted, and how I make a living from now on will be totally different. I won’t give too much away, but lets just say that I have exciting plans to create my future as business failure. I put on my most expensive outfit so as to blend in, although I felt a little conspicuous getting changed in the street outside harrods and tying a tie using Starbucks’ window as a mirror. In my last post, I showed my reaction to going to M&Ms World – a wildly consumerist shop in Leicester Square. How then, having recently gone to £0, would I respond to being in Harrods? In Harrods, pricetags are hidden. 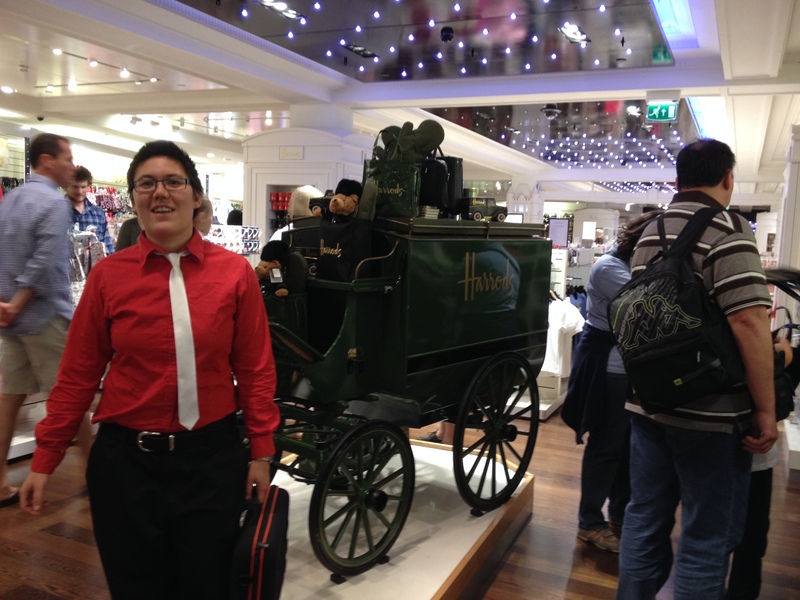 In Harrods, the staff wear suits. In Harrods, the toilets provide free perfume as well as soap. In Harrods, there are many expensive things, like a rucksack for £900 or a chair for £4000, or even a box of tea for £7 or a plastic biro for £5. I was appalled by M&Ms world, but I surprised to find that Harrods did not appal me. A £175 shirt… I have one that looks quite similar, but of course you can tell the difference at a glance because mine is blue. Why? 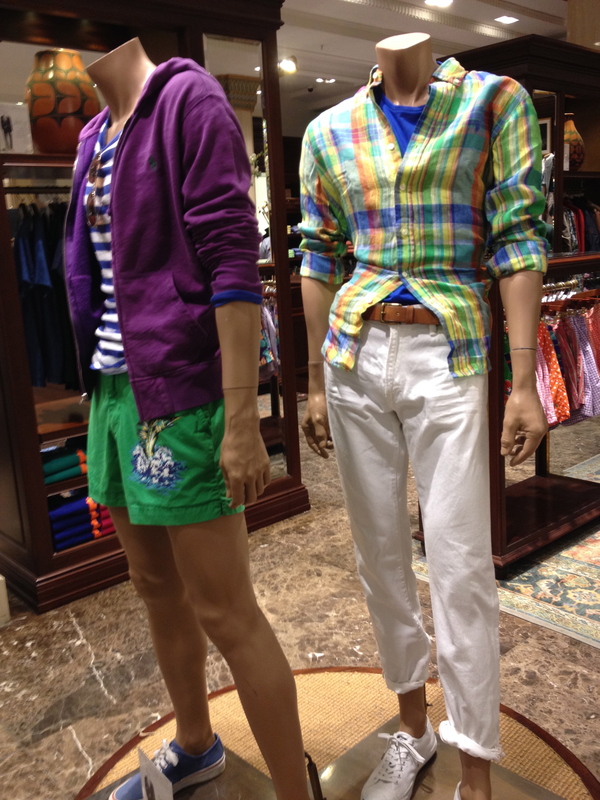 Well, in Harrods it seemed like there was no trickery or coercion. Stuff was for sale and you could buy it if you wanted to – isn’t that how shops should be? Items were on display, but prices were hidden, so you had to take a liking to something based on what it was, not on its price. Everything expensive that I saw seemed well made. Even where things were clearly overpriced (£175 for a shirt – well beyond the cost of its materials and labour), it seemed as though this was very plainly declared. M&Ms World, by contrast, was laid out to try and milk as many purchases as possible out of each customer, regardless of whether they would get good use out of them. Someone could of course buy a £175 shirt from Harrods, and consign it to the bin after 3 months. But being well made, it could also last them for 10 years or more, or be worn 2nd, 3rd and 4th hand for years to come. Products from M&Ms World on the other hand, were so cheaply made that they would quickly break, have no 2nd hand value so would soon end up in a landfill for sure. With only a couple of hundred in the bank and having stopped seeking work until my money runs out, it’s been interesting to watch my own thoughts. Sometimes I want to spend/give away all that money at once, other times I want to make it last as long as possible because I’m afraid of running out. 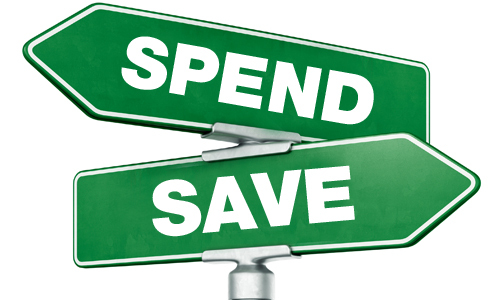 Basically, I’m oscillating between “must spend” and “must save” – two intrinsic compulsions that money provokes in people, both of which are quite destructive and unbalanced. Observing these compulsive tendencies in myself further convinces me of the importance of facing my issues surrounding money by taking up this £0 Challenge. Why not give all my remaining money to charity? Whilst this seems like a good idea, the point of the £0 challenge is to face my issues. Therefore, watching my reactions as my bank balance diminishes and working through my fears as I get closer and closer to zero, is an important part of the process and I should let the money run out in its own time. With any luck, I’ll end up less afraid of lack and be a more naturally generous person in the future anyway (which is worth much more in the long run than the small amount I could give to a charity today). How should I manage the decline to £0? Rule 1 of the £0 Challenge ( see – https://symphonyforhappiness.wordpress.com/2014/05/20/im-taking-the-0-challenge/ ) I’ve set myself is to stop seeking any type of paid work until my bank account reads £0. I made this rule on the assumption that if I stopped seeking work, then none would come my way. But what do I do if I’m offered work before my money runs out? Well, the aim is to mimic what would happen if my business dried up, so I should take work as it’s offered, but not seek any. Surely my money will keep declining anyway? But what if it doesn’t? What if I don’t promote myself, take no steps to seek gigs, students, clients for my recording studio, CD sales etc, and yet it simply refuses to dry up? That’s when I realized the beauty of The £0 Challenge. If I run out of money and then show that I can build a living for myself from that point, it’ll be a valuable journey for me to experience and for you to read about. If I try to go to £0 and find that I can never get there, in some ways, that’ll be even more profound! It would release my fears of running out of money in a completely unexpected way and it would be an anti-capitalist revolution. Some are winter rules and some are just van rules. Never get wet. If there’s no source of heat in your van, clothes can take days to dry or simply go mouldy. If you do get wet, it’s unpleasant but quickest to actually wear your clothes until they dry. Having to do that a few days running quickly puts you off ever getting wet. No shoes in the van’s living area – same reason as above. Keep some in-van slippers if you must. Keep electrical things in drybags. Condensation, literally caused by you breathing, can wreck your laptop so keep it safely in a dry bag when not in use. By now, you’ve got idea I’m sure – most of these rules are about combating wetness and damp during the Great British wintertime. Where possible, take the stove outside the van to cook, otherwise everything you own will smell of whatever you’ve cooked, forever. Wear thermal underwear all the time… Do I need to explain why? Never leave the laptop or guitar in the van. Just my personal rule. Those two things I could neither live without nor afford to replace, so I don’t leave the van without them. Don’t go to the toilet in the van, if you don’t have a toilet in the van. Don’t leave the lids off anything ever. Don’t spill a full bottle of sesame oil in van which contains everything you actually own (I didn’t do that… honest). Before getting out of the van, check for huge puddles / quicksand / sharks. If your van is too low to stand up in, remember not to stand up. Never get wet… did I mention that already?